I'm pleased as punch to welcome J.R. Wagner, author of Exiled to the blog! His book comes out in a mere 13 days and counting, and therefore he is on tour to promote it to the masses. Below you'll find what I think is a fabulous guest post! It's all about creativity and children. Enjoy! The carpeted floor has been covered by pieces of scrap wood he’s managed to find. What look like bloodstains speckle the top of the wood along with various other debris. In each corner are your antique wine barrels. Atop the wine barrels are two clay pots filled with a liquid stinking of lantern oil. Hanging from the old plaster walls are weapons. A bow, a chain with a nasty looking ball at one end, an axe. In the corner is a pickaxe. In the center of the room is a low table. More bloodstains are on and around the table. Some parents would use this opportunity to rush their son to the nearest hospital for a psychological evaluation. Not mine. What my horrified mother was looking at was not a torture chamber but a movie set my best friend Nick and I had created. We were shooting a scene from The Lord of the Rings (long before Pete Jackson had even thought of purchasing the film rights). She wasn’t actually horrified (although she wasn’t thrilled with the idea of the flaming clay pots…but lighting is everything, Mom!) she was intrigued. At least, I’d like to think she found my various creative projects intriguing. In second grade I would spend my recess re-enacting The Return of The Jedi with my friends. No props, all imagination. 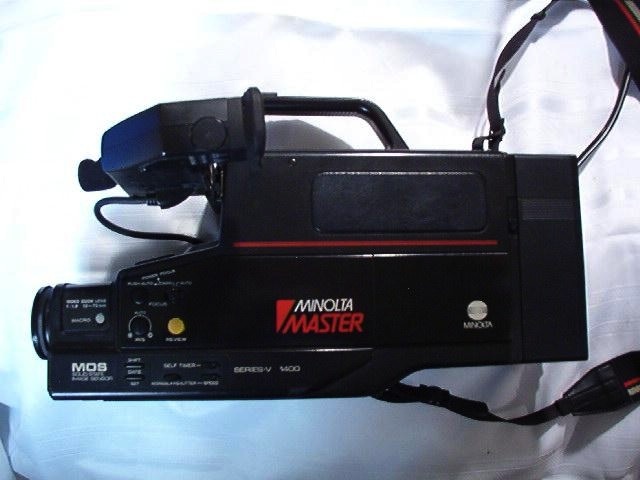 In third grade I used the family video camera –one of the old-school shoulder-sitting beasts to begin my filming career. Yep, it was just like this bad-boy. Huge, cumbersome and had terrible audio and video recording quality…but it was the best thing a boy could ever have! In seventh grade, my dad bought me a top-of-the-line video camera. Out of nowhere, he came home and gave it to me. I can still recall where I was standing when he brought it home. I loved that camera. I even remember which of my cousins would eventually lose my childhood dream-come-true. There MAY be some slight hostility left in the recesses of my emotions over that. Just sayin’. Not only did I film as a child. I wrote the screenplays for the films. I wrote short stories. I wrote longer stories. One of my teachers had us keep journals in class. Everyday we were given time to write in our journals. Rather than write about my day or the latest episode of Different Strokes, I wrote the sequel to Jaws. I think my teacher found the death scenes I’d drawn in the margins somewhat disturbing based upon her expression but she never asked me to change the subject. I still have that journal. In fifth grade everyone was assigned to write a story that would be ‘published’ in the year-end fifth-grade publication. It probably had a name, but I sure as heck can’t remember it. The prompt was; if you could go back in time and change something… My parents rolled their eyes when they got their hands on this gem. I had decided to write about traveling back to the civil war…with a cache of AK-47’s where I proceeded to wipe out the entire Confederate army in a single day. I probably saved tens if not hundreds of thousands of lives and ended the bloodiest war in our countries history in one day. Most of my readers saw only the disturbing aspect of my ultra-violent resolution –yet, without one bit of censorship, it made it in the fifth-grade publication. Would that have today? I doubt it. Both parents encouraged my creativity in their own ways. My dad supplied the hardware and stayed far, far away from my movie sets and my mom would often play a role in my films when nobody else was around. She almost fell victim to my sheep-killing alien creature…but the family dog managed to distract it at the last moment (and became dinner). My teachers never told me to change topic or sent me to the guidance counselor for a psychological evaluation (Thank you!). I believe it was this support that kept the creative part of my brain running, full steam ahead, into adulthood. I kept on writing and eventually, fulfilled the dream of publishing a novel. (And I’m just getting started) I also believe it is essential to the upbringing of all children to support their creativity as much as possible. Being able to create something from nothing translates into so many aspects of a successful life. Providing an outlet for teen angst, a means of escape from the often crappy world they must brave every day, allowing teens to create their own focal point and hone in on it rather than telling them where they need to focus –these things make a difference in who they become. And now, a giveaway! Up for grabs is a digital copy of Exiled! To enter, please fill out the form below. I will pick a winner on May 30, 2012. Good luck!